We are the Inner City Youth Orchestra of Los Angeles (ICYOLA), the largest majority African American orchestra in the country. Founded in 2009, ICYOLA is a California 501(c)(3) nonprofit corporation that transforms the lives and minds of young people in Inner City Los Angeles through high quality music education. It teaches inner city youth the great music of the world, and provides opportunities for them to perform that music in the most magnificent settings of our community. It prepares its members for advanced study and high caliber success in music and otherwise, and instills the ancillary benefits that music instruction provides: problem solving skills, critical thinking, self-reliance, self-confidence, self-discipline, and the crystallization and pursuit of meaningful purpose. ICYOLA offers three programs: the ICYOLA Orchestra Program; the ICYOLA Academy; and the Los Angeles Orchestra Fellowship. Through the ICYOLA Orchestra Program, we present an annual Concert Season that features both the standard orchestral repertoire and contemporary music that resounds within the community that ICYOLA serves. Through our ICYOLA Academy, we teach students at Los Angeles Unified School District elementary schools how to play an instrument. Through the Los Angeles Orchestra Fellowship, we train emerging professionals to take and win auditions with American orchestras. ICYOLA is a member of the League of American Orchestras, and is a national leader in the effort to assure diversity in the arts. To cultivate musical expression as a vehicle for personal development, and to bring to fruition the full musical and academic potential of young inner city residents of Los Angeles. ICYOLA offers three programs: the ICYOLA Orchestra Program, the ICYOLA Academy, and the Los Angeles Orchestra Fellowship. The ICYOLA Orchestra presents a regular concert season each year that features both the standard orchestral repertoire and contemporary music that resounds within the community that ICYOLA serves, and that culminates each year with a Season Finale Concert at the Walt Disney Concert Hall. This orchestra boasts approximately 130 members aged 10 and above. The ICYOLA Academy is our teaching program through which we teach music and literacy enhancement on the campuses Los Angeles Unified District Elementary Schools, and in the Winter, Spring and Summer, we offer Camps at various locations throughout Greater Los Angeles. The Los Angeles Orchestra Fellowship is a unique partnership between one of the world’s leading chamber orchestras, the country’s largest African-American-majority youth orchestra, and a university with one of the country’s top music programs. The West Coast’s first comprehensive orchestral fellowship program for top-tier string musicians from underrepresented communities, The LA Orchestra Fellowship is a two-year orchestra intensive for musicians on violin, viola, and cello. Fellows will be mentored in chamber and orchestral performance and gain invaluable experience while training and playing alongside LACO musicians, faculty at USC Thornton, and guest artists. Inner City Youth Orchestra of Los Angeles, Los Angeles Chamber Orchestra, and USC Thornton School of Music invite applications for The LA Orchestra Fellowship inaugural class of 2020. The Los Angeles Orchestra Fellowship is made possible by funding from The Andrew W. Mellon Foundation. To teach youngsters in Los Angeles the great music of the world, provide opportunities for them to perform that music in some of the greatest settings of the world, and prepare them for opportunities to play in major American orchestras. 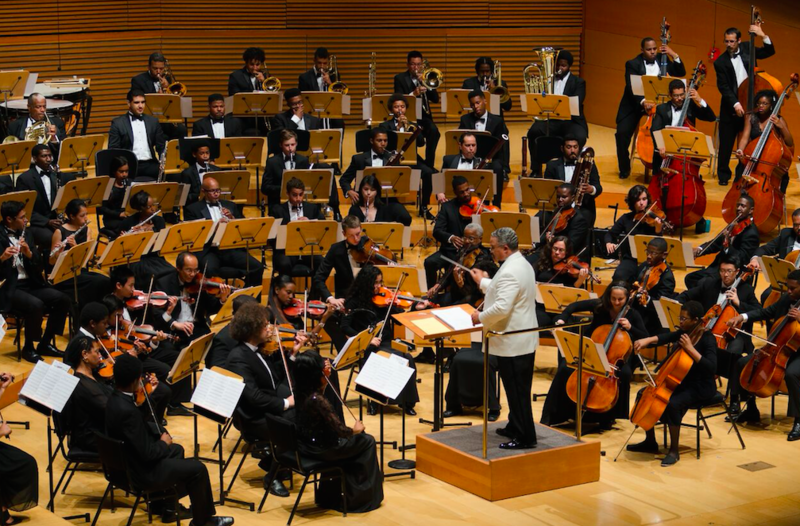 To learn and perform the great orchestral literature of the world, and equip minority youth, especially African-American and Latino youth, with the tools needed to join major American orchestras; and to present those young people to those orchestras as candidates for employment. Charles (Chuck) Dickerson is the Executive Director and Conductor of the Inner City Youth Orchestra of Los Angeles. Over his 40 plus years of conducting, he has directed performances of many of the greatest orchestral and choral works throughout the United States, Europe, and Asia. He has prepared choruses for concerts with the Los Angeles Philharmonic and the Hollywood Bowl Orchestras including the Phil’s 2012 performance of the Mahler Eighth Symphony and performances of Beethoven’s Ninth Symphony with Maestro Gustavo Dudamel conducting. Chuck also holds important compositional and arranging credits. His best-known work is “I Have A Dream,” a choral and orchestral setting of the Dr. Martin Luther King Jr.’s landmark speech. The work was performed for the unveiling ceremonies of the King Memorial on the National Mall in Washington DC, and at the Walt Disney Concert Hall in Los Angeles for Los Angeles County’s official celebration of the 50th Anniversary of the speech. He has also arranged and conducted orchestral performances of the music of Duke Ellington, Stevie Wonder, Motown and others. He holds a Master of Music Degree with a focus on conducting from California State University, Los Angeles, and degrees from Howard University (B.S.) and American University (J.D.). He has studied with esteemed Conductors Gustav Meier, Daniel Lewis, and Kenneth Kiesler. He also currently serves as Director of Music at Rolling Hills United Methodist Church, Director of the Leo Baeck Temple Choir, and Instructor of Conducting and Director of Special Ensembles at California State University, Dominguez Hills. He formerly served as Music Director and Conductor of the Southeast Symphony (2004-2011). He has held important public and civic leadership positions in Washington DC and Los Angeles. Chuck is married, has two adult children, is a proud grandfather, and is an avid baseball fan. It is uncommon to see a youth orchestra in such a short time assume a leading role in the celebratory function of its host community the way the Inner City Youth Orchestra of Los Angeles (ICYOLA) has done over the past eleven years. Its play at various social, religious and political functions in the greater Los Angeles area, and in the nation’s capitol, has been a welcome addition to the music and cultural landscape of the region. The Orchestra has provided music for cotillions and debutante balls; it has been the featured musical entertainment at community banquets and dinners, including the Annual Urban League Gala, among others; it has been the orchestral accompaniment for inaugural political events for a host of U. S., California State, and Los Angeles County and City representatives. The Orchestra was the only large classical music ensemble invited to help dedicate the Martin Luther King, Jr. Memorial in Washington, D.C. The Orchestra has played on more than one occasion for First Lady Michelle Obama. The tireless work of the Orchestra’s Executive Director and Conductor, Charles E. Dickerson III, has added to this impressive list of public performances celebrating the community which supports the Orchestra. 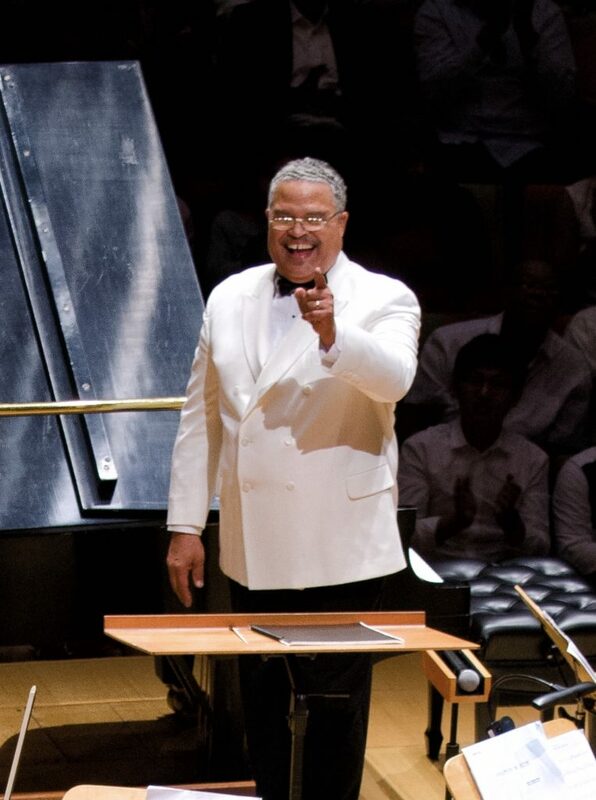 Dickerson has composed two major symphonic works, one of which, the “I Have a Dream” symphony, has been performed by the Orchestra both in Washington, D.C., and in Los Angeles on several occasions, including, here in the Walt Disney Concert Hall, on the 50th anniversary of that most famous oration of 20th Century America. The second major symphony composition by Dickerson, Symphony No. 1, known as “The Mandela Symphony,” celebrates the extraordinary and sacrifcial life of South African President and Freedom Fighter Nelson Mandela. Like the “I Have a Dream” Symphony, “The Mandela Symphony” will have its world premiere performed by the Inner City Youth Orchestra of Los Angeles. ICYOLA acknowledges its debt to the community and to the lives in it. In the coming years of great performances and local appearances, the Orchestra will continue to draw inspiration for its own effort from these lives.